Ahi Tuna (Yellowfin) Steaks Grilled with a Mediterranean Flair. Yellowfin Tuna or Ahi Tuna is usually served either Raw, as in sushi or Seared. or Grilled. When I first had this tuna grilled in spain with olive oil and salt I couldn't believe it was fish at all. This recipe is a bit of a cross between seared italian style and Spanish grilled. A recipe that is easy to make and full of flavor. Who says you have to serve fajitas in a flour tortilla? Instead of serving peppers in the fajitas, I serve fajitas in a roasted pepper! Roasted peppers and almonds pair with fresh parsley in this tangy Spanish-inspired sauce. This low-carb crust is great on its own or topped as you would pizza. A great dip to take to a party or have at a small get together. Wonderful with rye bread or crackers. Nestle eggs into a spicy tomato sauce and bake them for a light and easy supper. Serve over pasta or with crusty whole-wheat bread for dipping. A budget version of the rustic Spanish favorite. An herbed-citrus olive pesto adds color and intensifies the flavor. 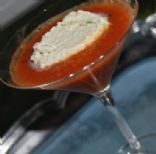 I think that gazpacho is quite the refreshing soup option--especially in the summer. It goes well with a simple sandwich as well as something a little fancier and off the grill. Not only that, but it is actually pretty healthy for you as well--gazpacho is made up of all kinds of different veggies. I threw this together with ingredients I had on hand since I couldn't get out to the store because of the snow and it was a hit with my DH and picky daughter. Delicious! Reminded me of a Cuban dish I had in Navarre, Florida while visiting a friend. easy, delicious and super quick! I found a similar recipe on a website before, but it called for tomatillos and not nearly enough mango! A tasty and flavorful soup to appease both carnivores and vegetarians. A fabulous fish dinner, even better when served with whole grain rice. 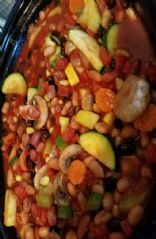 I got this recipe from a Low Carb Crockpot cookbook and "tweaked" it for lower cholesterol and sodium content. STILL high in sodium, though! This dish is simple and quick--you'll love it. Serve it for Thanksgiving or any night of the week. Okay, so that is clearly my opinion. Let me know what you think. Yummy and healthy! If available use tilapia instead of cod. Recipe is easy and so light and tasty. Enjoy! Power meals for your family - 100 % Wholesome! Add a dash of hot sauce to your bowl for extra heat. Use a variety of your favorite beans if you wish.